ORONO, Maine – The Orono Trampoline Park opened its doors two years ago in September. Now, for once a month on Wednesday’s, they have a new event during the mid-day to give homeschool students a chance to steam off energy. “It is a way to reach different parts of the community and reach new people while making use of the facilities,” said Orono Trampoline Park general manager Rachel Grignon. Homeschool day allows homeschool students and their families early access to the 40,000 feet worth of trampolines. From 12-3, homeschool students get to come in for a discounted price. The Orono Trampoline park includes a battle beam, a dodgeball court and two different basketball hoops. “It is a great way to blow off steam,” said father Alan Whitney. “I see this as the same thing as recess.” Whitney has two homeschooled daughters (4 and 6) that he has brought to homeschool day a couple of times. Homeschool days has seen much success according to Grignon, but has seen the pace turn down as the weather gets nicer. The night will stop in May or June, but will pick back up in September or October said Grignon. Most of the kids who have shown up are elementary aged but all ages have showed up. 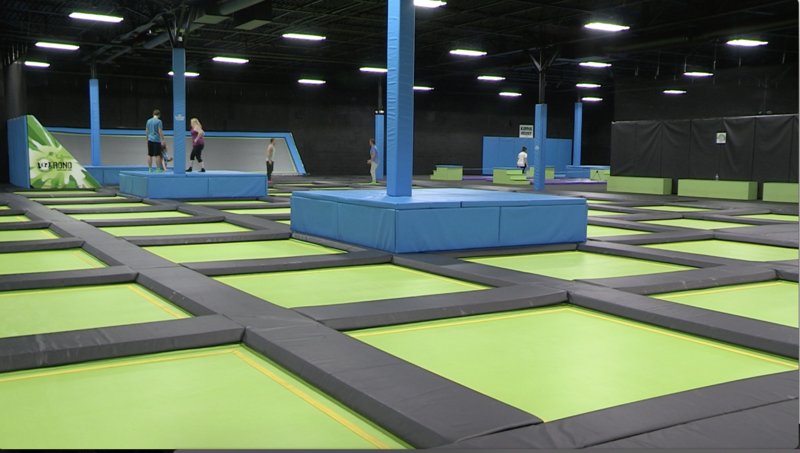 The Orono Trampoline Park also offers fitness classes and Teen or College nights on Mondays. Every Friday and Saturday, the park is lit up for Glow Night. Teen Night has been in operation since the Park’s opening and offers a similar deal to homeschool day. Teen night takes place on Monday nights for the same discounted price. ”It is hard for the teens to have fun. Teen night is a great night to come and socialize a little and do what you wanna do,” said customer Kyle Newall. Both Teen Night and Homeschool day cost $8 for an hour of jumping. Waivers can be filled out before arriving and all jumpers require the appropriate socks available for purchase and can be recycled. The park also hosts parties which include one hour of jumping time, 40 minutes in their playroom, pizza, and ice cream. Packages on weekdays start at $200. The Orono Trampoline Park is located on Stillwater Avenue right by the Spotlight Cinema movie theater. For more information on the Orono Trampoline Park, you can find them online at OronoTrampoline.com or find them on Facebook.